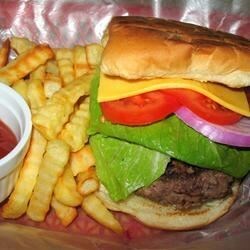 "This is one of our favorite hamburger recipes. You can substitute bleu, gorgonzola, or feta for the Roquefort cheese. Don't forget the American fries!" mmmmm these burgers are fantastic. I used goat cheese and topped it with avocado. amazing. These were a hit, thanks. They were pretty Thyme-y, and I couldn't really taste the cheese. I'll try gorgonzola next time. This was a very easy and delicious recipe. We followed the recipe exact and used blue cheese. We will definitely be making these again.